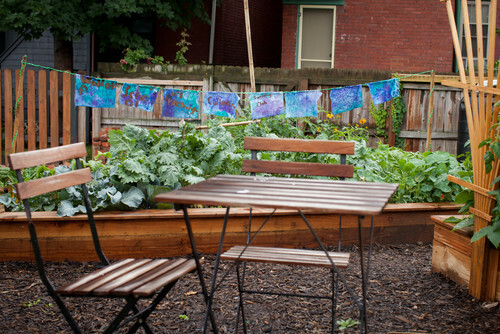 With a name like Friendship, is it any wonder this neighborhood created such an enchanting community garden? Natural beauty is often found in the most unexpected places. Kristin Hughes found it in an empty city lot behind her home in the Friendship neighborhood of Pittsburgh in 2009. After a fire left an abandoned building uninhabitable, Hughes decided to build a community edible garden on the newly vacant 3,600-square-foot lot. With the help of local high school students and an organization called Grow Pittsburgh, Hughes built raised garden beds using leftover bricks from the former demolished home and lumber donated by Massaro Construction. Horseradish, rhubarb, sweet potatoes, asparagus, purple magic beans, herbs, blueberries, black currants and fruit trees now all flourish in the garden. 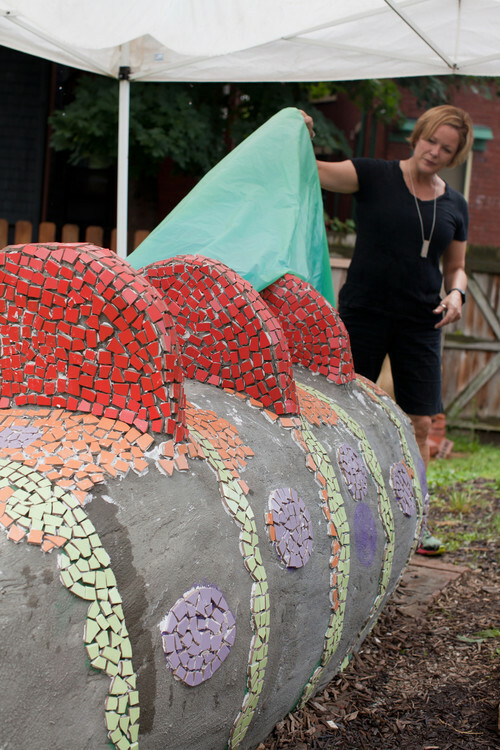 When local artists Lauren Jean McLaughlin and Bob Ziller donated a large mosaic sculpture of an octopus, the community lovingly dubbed the space the Octopus Garden. 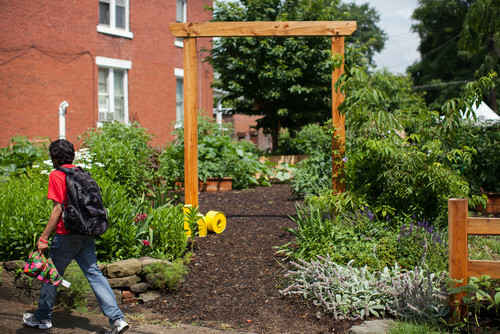 Budget: Fifteen gardening families and 87 funders contribute to this garden's bounty. Repurposed yellow metal letters welcome garden visitors with a friendly "ho" before they pass through the simple arbor. The garden had a rough start. By the time the lot had been leveled and prepared for planting, it was late in the summer; 50 half-dead pepper plants kicked off its inauguration. But through persistent trial and error over the past several years, and with the help of many members of the community, Hughes was finally able to create a magical gathering space. 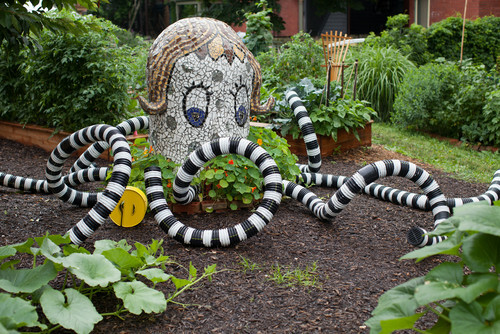 The mosaic female octopus sculpture, named Octavia, proudly sits in the center of the garden. 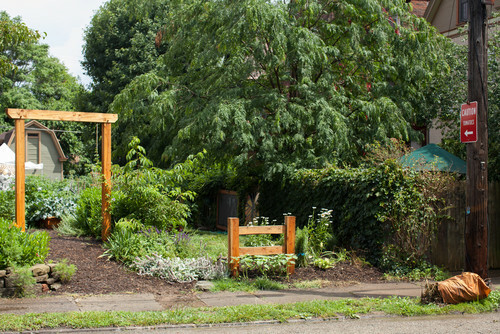 McLaughlin and Ziller initially created the piece for the Three Rivers Arts Festival and later donated it to the garden. Edible nasturtiums grow around the sculpture. Posted on a telephone pole, a sign reads: "Caution, Tomatoes." "The foundation for the garden is anchored around the four guiding principles developed by the Center for Eco-Literacy," Hughes says. "Nature is our teacher. Sustainability is a community practice. The real world is the best learning environment, and sustainable living is rooted in a deep knowledge of place." Hughes tends to a garden bed. Her personal section of the garden includes dinosaur kale, zucchini and lemon squash. She hopes the garden will continue to grow to the point where, with a little help from the city, its fresh vegetables and fruits could feed schoolchildren in at least five areas. Students in the Waldorf School of Pittsburgh's culinary gardening club created this cloth banner. 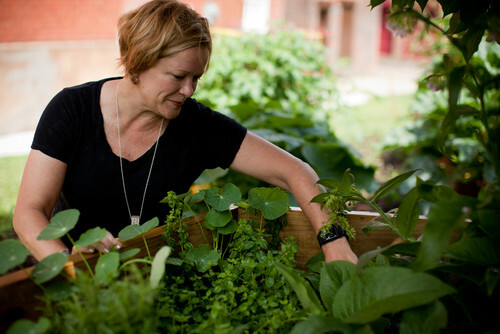 Hughes considers the garden to be a "creative canvas where kids learn about where their foods come from." Hughes also hosts monthly garden parties in which guests are asked to bring a dish to feed four people, centered around a chosen theme. Guests are encouraged to gather herbs from the garden to use in their dishes. The garden continues to thrive with the help of community donations. 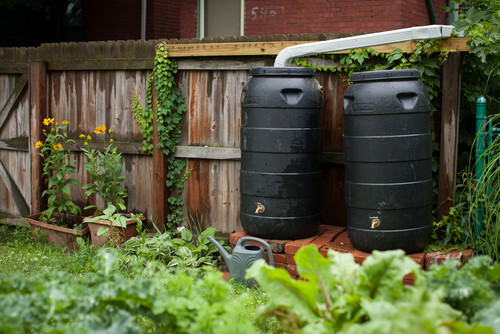 A local Whole Foods store donated these rainwater collection barrels. Eggplant thrives in the summer season. Cool-season vegetables grown at the Octopus Garden include horseradish, rhubarb and asparagus. 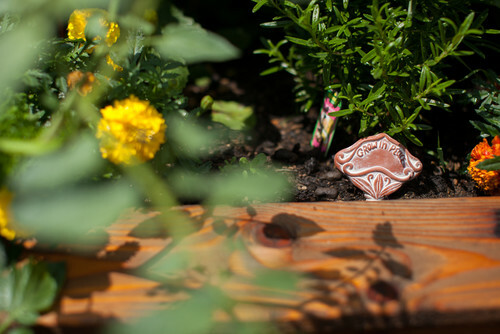 A raised bed holds herbs and medicinal flowers that can be used for cooking and for naturally enhancing handmade soap. Here's Hughes a few years ago unveiling a work in progress in the garden — a mosaic sea creature sculpture by McLaughlin and Ziller, funded in part by Heinz Endowments. The sculpture sits at the back of the garden; according to Hughes, "The head of the sea creature will capture rain, tunneling it out of the mouth to a small flower garden." Its nostrils will capture the sound of the wind, and its solar-powered eyes will light up at night.